Aston Villa were given one of their toughest home tests of the season as they missed a chance to move back up to second in the Championship, being held by promotion rivals Preston North End. North End looked poised to win when a poor clearance let in Tom Barkhuizen's overhead kick to earn a half-time lead. But Villa responded well to the half-time introduction of substitute front pair Lewis Grabban and Keinan Davis. Davis won the penalty which Grabban calmly converted from the spot. The January loan signing from Bournemouth sent North End keeper Declan Rudd the wrong way, holding his nerve to stroke the ball right down the middle for his first goal for third-placed Villa, who moved back to within a point of Cardiff. Preston drop two places to ninth, despite a second very good performance in three days after also holding leaders Wolves on Saturday. The hosts had the better of the first half, Rudd going full length to keep out Birkir Bjarnason's long range effort, then a John Terry header from the resulting Robert Snodgrass corner. He also denied Scott Hogan's powerful near-post shot after a clever turn. But, when Johnstone was tested at the other end on 37 minutes, he tried to punch clear under pressure from Callum Robinson's left-wing corner, could only flap at it and Barkhuizen's cheeky scissors kick looped into the net. If Villa were unlucky to trail at the break, they were soon lucky not be further behind, as Johnstone atoned with big saves from Paul Huntington's header and former Villa trainee Robinson's shot. But, after a Preston purple patch, Grabban came to the rescue from the spot when Davis went down after being shoved in the back by Barkhuizen. And it was then Villa who came closest to winning it. Grabban's right-foot volley dipped just over and Alan Hutton then cut in to send a lower trajectory right-foot shot fizzing past the right angle of post and bar. Then, after a great flick and turn, Davis sent Grabban down the right but, when the youngster latched onto the end of the cross to complete what would have been a magnificent one-two, he steered it wide. "We found it difficult. They've only lost one in 17 and you can see why. They have a fantastic work effort with good players and, in this league, they're a threat for anybody. "We've given them a goal. They got a break with their first attempt which was a mistake by us. Then Snoddy (Robert Snodgrass) was sick at half time and we had to change fit. "If I'm being brutally honest, when I first saw it, I thought our penalty looked a bit soft, but having seen it again on the video, it was actually a ridiculous challenge. He just jumped into him. The referee and linesman have got it spot on. "It might not have been fair but we might even have won it in the end. The best ball of the match and Keinan Davis couldn't quite get on the end of it." "We were the better side viewed over the 90 minutes, in every facet of the game. We've come here and dominated. "It's just disappointing that it was a really soft penalty that got them back into it. It was the linesman that gave it, not the referee. "Whenever you come to a big away ground, you hope that it will be a level playing field and that you get a strong referee and I didn't think that was the right decision. "But we created enough chances to have won it. And we only scored one goal and that leaves you susceptible." Match ends, Aston Villa 1, Preston North End 1. Second Half ends, Aston Villa 1, Preston North End 1. Keinan Davis (Aston Villa) wins a free kick in the defensive half. Substitution, Preston North End. Connor Simpson replaces Tom Barkhuizen because of an injury. Attempt missed. 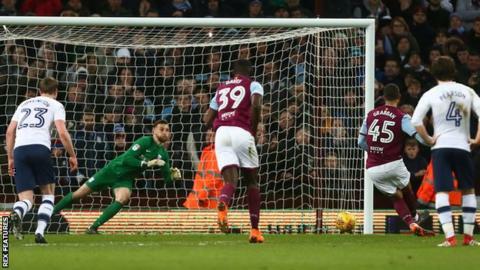 Keinan Davis (Aston Villa) left footed shot from the centre of the box misses to the left. Assisted by Lewis Grabban with a cross following a fast break. Substitution, Preston North End. Josh Harrop replaces Billy Bodin. Attempt missed. Alan Hutton (Aston Villa) right footed shot from outside the box is just a bit too high. Assisted by Josh Onomah. Attempt missed. Lewis Grabban (Aston Villa) right footed shot from outside the box is high and wide to the left. Assisted by Scott Hogan. Substitution, Aston Villa. Ahmed El Mohamady replaces Axel Tuanzebe. Substitution, Preston North End. Daryl Horgan replaces Louis Moult. Attempt missed. Scott Hogan (Aston Villa) header from the centre of the box misses to the left. Assisted by Birkir Bjarnason with a cross. Attempt saved. Paul Huntington (Preston North End) header from the centre of the box is saved in the centre of the goal. Assisted by Tom Barkhuizen. Corner, Preston North End. Conceded by Axel Tuanzebe. John Terry (Aston Villa) is shown the yellow card for a bad foul. Attempt blocked. Callum Robinson (Preston North End) right footed shot from the centre of the box is blocked. Assisted by Billy Bodin. Attempt missed. Tom Barkhuizen (Preston North End) right footed shot from outside the box is too high. Attempt saved. Lewis Grabban (Aston Villa) right footed shot from the right side of the box is saved in the bottom right corner. Attempt saved. Louis Moult (Preston North End) right footed shot from the left side of the box is saved in the top centre of the goal. Assisted by Billy Bodin. Mile Jedinak (Aston Villa) wins a free kick in the attacking half. Corner, Preston North End. Conceded by Alan Hutton. Goal! Aston Villa 1, Preston North End 1. Lewis Grabban (Aston Villa) converts the penalty with a right footed shot to the centre of the goal. Penalty Aston Villa. Keinan Davis draws a foul in the penalty area. Penalty conceded by Tom Barkhuizen (Preston North End) after a foul in the penalty area. Offside, Aston Villa. Scott Hogan tries a through ball, but Lewis Grabban is caught offside.